Click here to see a video of the Station Theatre Conversion on the hiads site. 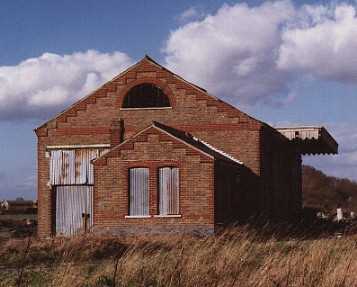 When the old South Hayling Goods Shed came up for disposal in December 1992, Hayling Island Amateur Dramatic Society (HIADS) put in a bid to Havant Borough Council, who offered the building and the site at a peppercorn rent, to convert it to a 144 seat theatre. An architect with previous experience of such conversions, Martin Critchley was engaged, plans drawn up and the initial estimated cost for the project was about £180,000 to be carried out in three phases. Hampshire County Council gave it their full backing with a grant of £20,000 and fund raising started apace. Local support, both financial and in kind was forthcoming and the project caught the imagination of the islanders. 25 events, including coffee mornings, a Smarties campaign, plant sale, jumble sales, concerts, a cabaret, a promises auction and many others saw the fund raise to £50,000 by the end of the first year. This was enough to start Phase I, the conversion of the dilapidated shed into a sound and secure building in architectural sympathy with the original, which would form the stage and auditorium. Keen competitive tendering saw Carrels & Sons of Havant win the contract and Phase I was completed in May 1994. Whilst the refurbished building was used for further fund raising in 1995 and 1996, successful bids were put in for grants from the Foundation for Sports and the Arts, (£40,000) and the National Lottery (Arts Council - £120,000). Indeed HIADS were the first amateur theatre group on the south coast to receive an Arts grant. HIADS had to match with their own money (40%), but by June 1995 they had sufficient funds to go ahead with Phases II & III together, the addition of the foyer (with bar and toilets), arcade, studio (with wardrobe over) and workshop. Escalating costs meant that they had to hold back on non-essentials; and Hayling Builders won the tender for this work which started in November 1995 and was completed in June. Major events were held to raise money, including a Hayling Billy railway exhibition, a Wartime Hayling exhibition (including cabaret), and many smaller events, whilst the Mayor of Havant's appeal contributed £1,500 towards the bar. The seats were generously sponsored by firms and individuals, as were the auditorium station lamp shades and notice boards. Altogether fund raising, donations and sponsorship from Hayling Islanders and friends brought in over £120,000 for this part of the development for which HIADS thank all concerned. The Station Theatre prior to surfacing the car park. At this stage there was still much to do! HIADS had not been able to afford the surfacing of the car park (£10,000), stage curtaining, foyer and backstage carpets (£4,000), and new lanterns for the modern lighting system (£6,000). In October 1997 a generous patron sponsored our FOH Curtains, and in December the National Lottery granted a further £39K to complete the building work on the Theatre, including the Car Park, a lobby on the foyer, landscaping etc. It has been through the generosity of so many that HIADS can say 'Thank you - our dream has come true'. To read more about HIADS history on the HIADS website, click here.